I took this several weeks after a suspicious fire ravaged this home, with the sun shining right through the collapsed second-story. The once-brightly colored stuffed animals surrounding the memorial had become faded and droopy from rain. I was surprised to find any news at all about what happened, but both local papers reported the fire, stating that a man in his fifties died here, possibly a squatter. The girls across the street just told me a man died there. 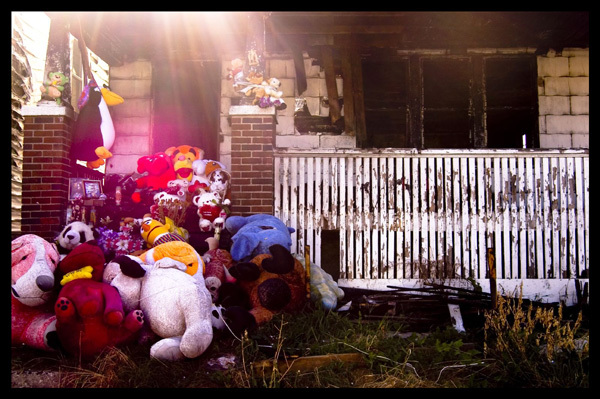 Who ties teddy bears around a burnt pillar for a squatter? Who leaves flowers and devotional candles for someone the papers didn't even bother to name? Who was the man in the photo next to a framed painting of Jesus? You see so many of these "makeshift memorials" around this city, it's clear this is considered an appropriate and even standard outpouring of grief and love, like this. Or this. There are almost always huge stuffed animals---the kind you "win" in rigged fairway games and carry away as a badge of a father's (or a lover's) skill. I often wonder why people began using so many stuffed toys in these memorials, especially when the deceased was not a child, but as in this case a man in his fifties. Is it because they bring color and even cheer to a scene that experienced a shooting or a fire? Do they serve as a reminder of better and more innocent times? Or do they simply say, Take Note: someone died here. He is not forgotten.